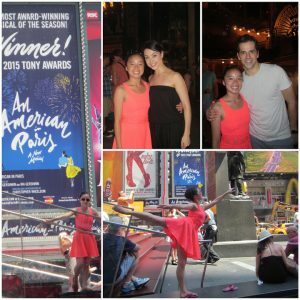 How do you top seeing An American in Paris in NYC, the most award-winning musical of the season? With a surprise personal backstage tour to meet the cast, courtesy of Mr. Carney! FVAD Pre-Professional student Ann poses with leads Leanne Cope and Robert Fairchild on stage at the Palace Theatre on Broadway after the show. A big thank-you to Jackie Barrett (assistant and ballet mistress for choreographer Christopher Wheeldon) for making this happen! Mr. Carney and Jackie Barrett trained together full-time at the Royal Ballet School and then went on to dance for several years together in English National Ballet (then called London Festival Ballet).